This week's Sweet Melissa Sundays (SMS) recipe was chosen by Julie of A Little Bit of Everything : Carrot Cake with Cream Cheese Frosting. I've tried Dorie's carrot cake recipe, but the Pastry Queen's remains my favorite, so I was eager to try another recipe to see how it compared. Per my usual, I omitted the nuts from this recipe (sorry, don't like nuts). Then I realized that I was running low on sugar, only as I was in the middle of making this cake. So, it ended up having only 1.5 cups of sugar in it instead of the full 2 cups. My mom is always commenting on how dessert are often too sweet and cuts back on the sugar in most recipes anyway, so I wasn't too concerned about it. Well, my mom was right because I couldn't even tell that the cake was missing a half cup of sugar. The cake itself was extremely moist, though I did miss the pineapple and coconut that it is in my favorite recipe. The cream cheese frosting didn't have a very strong cream cheese taste to it (which I generally love), but instead tasted light and airy (despite containing two sticks of butter in it!) with a strong citrus flavor. Overall, I enjoyed this cake. It was a very light and refreshing carrot cake and the orange zest really makes it special. My favorite carrot cake is still this one though, so make sure you check it out if you like carrot cakes. 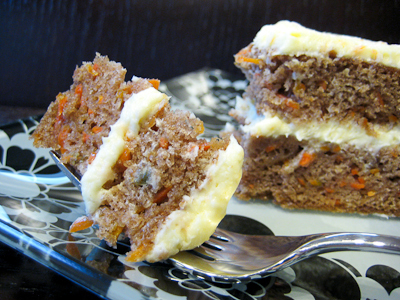 If you would like to try this carrot cake recipe, you can find it here. 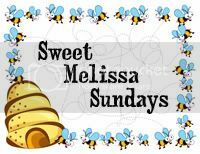 Make sure you check out the Sweet Melissa Sundays Blog Roll to see how everyone enjoyed this cake, which would make a wonderful addition to any Easter table. - I only added 1.5 cups of sugar and found the cake to be just fine. Not sure if the full 2 cups would make it too sweet? - Make sure you check out this link to see how you can quickly and easily make parchment rounds to line your cake pans. The cake in the glass looks amazing. It just makes me want it to eat it! I'm glad that you enjoyed it; my friends did too! I don't like nuts either Jaime so they're always the first to go from my baked goods :) Your cake looks lovely! I enjoyed this one a lot but I'm curious about your go-to recipe so I'll have to give that one a shot the next time a carrot cake craving hits! I like the cake in the tall dish. Gorgeous! Way to go on cutting back the sugar, your mom is a smart lady! I love how you put it in the glass, it looks so elegant! I thought this cake was amazing. It was moist and the frosting was to die for..Iloved the orange zest too!I too, have a very fav. carrot cake recipe that I love. This one will be my second favortie and my fav.so far out of the SMS recipes! Love the cake in glass. Very fun! Is that like a parfait? It's gorgeous! What a neat idea. Your presentation in the glass is beautiful! I also read your 'other' Carrot Cake recipe and printed it. Thanks. I love the last photo with the cake layered in the glass. Beautiful! Love that cake in the glass. So sweet! carrot cake is awesome, and that's all there is to it. i also enjoy pineapple and coconut in mine, but i haven't yet tried your recipe with the cream of coconut. methinks i'd never look back after one taste of it! 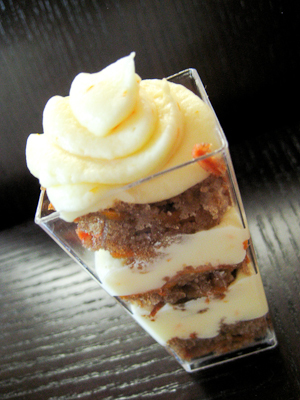 oh, and i love the carrot cake shooter. excellent idea! Oh I like the orange cream cheese frosting, just something a little different. Love the presentation, so creative and fun! I have made your fave carrot cake before ant is awesome, so I would miss the pineapple too, but I love your little parfait. so cute! Well, I have found the perfect carrot cake! Yours looks amazingly delicious and I would love a slice right now! It looks very refreshing and great with the orange zest! Thanks! Love how you served this one in the second picture almost like a parfait. Looks awesome. Beautiful photos, I love the cake in the glass. I learned this week that my boyfriend loves carrot cake and, though we liked this one, I am definitely interested in trying some different recipes. I have to agree with Grace, I love the cake shooter. The cake looks moist and delicious. I've never eaten or made carrot cake because it's always loaded with so much stuff (especially EW, raisins!) but it's recently dawned on me that DUH, I can make it how I like it. This recipe sounds like a good starting point. Sorry for commenting late. I just have gotten back into town after being gone for several days. Most of the time I agree with your Mom. I always cut back a quarter of the sugar. And it never seems to have an ill affect on the final outcome. BTW so good of you to do this cake even though your favorite is with the coconut. When I was in TWD a lot of people hated to do ones that they had a fav for.